This study focuses on an evaluation of the dynamic modeling and discharge performance of magnesium battery activated by sea water. Modeling is important to determine the optimum condition of battery discharge operation. The modeling was performed by modifying the Shepherd model approach by combining an Rint equivalent circuit model to avoid the looping algorithm problem. Initial parameters were obtained from battery discharge manufacturing data on open operating systems. The battery anode used magnesium foil, the cathode used carbon, while the electrolyte used 3.5%wt NaCl solution. The battery discharge test to obtain manufacturing data was carried out with variations in current loads of 0.01 C, 0.05 C and 0.1 C until the potential and current were zero. Battery discharge performance evaluation can also be performed from manufacturing data analysis. Potential battery discharge decreased from ±1.49 V to ±1.30 V, while the battery discharge potential was relatively stable at ±1.30 V to the SOCmin potential value (±1.29 V). It can be seen from the different values of exponential and nominal potential that the parameters were not too significant. The modeling has convergence on the discharge parameters, such as E0 = 1.303 V; R = 0.012 ? ; Kdr = 0.01 ? ; Kdv = 5.794×10-4 V/A.h A = 0.195 V; and B = 140 (A.h)-1. The SOCmin value of 5% indicates a minimum limit of battery operation that is permitted for battery performance to drop suddenly. The SOCmax value of 93% indicates the maximum allowable limit for the battery to operate stably. The percentage of simulated data error compared to the manufacturing data is 0.85%. Magnesium batteries activated by seawater are a renewable energy source (Chen et al., 2013). Magnesium can replace conventional seawater battery anodes (Zn, Al, Sn) because it has a discharge profile that meets the criteria for potential, current and discharge energy, and even has a discharge potential greater than conventional seawater batteries (Supriyono et al., 2017). Magnesium is also worthy of consideration for use as a seawater battery theoretically. It has a standard reduction potential value of -2.370 V compared to a Standard Hydrogen Electrode (SHE), which is high enough for the battery anode (Bard & Faulkner, 2001). Magnesium can store large amounts of power with a small mass and material volume. It has a high gravimetric charge density theoretical value of 2233 mAh/gram and a high volumetric charge density theoretical value of 3881 mAh/cm3. Magnesium is very abundant in the earth's crust and moreover the preparation of magnesium battery activated by seawater is also relatively easy (Koontz & Lucero, 2002). One application of magnesium batteries activated by seawater is an energy source for lighting buoy lamps, in which the battery electrode is dyed directly in the open sea water system. Magnesium has a galvanostatic discharge pattern similar to that of lithium, but differs in its potential value range, current, capacity and discharge energy. The modeling of a magnesium battery activated by seawater requires prediction of the optimum conditions and the possibility to control these as an energy source for lighting buoy lamps effectively and efficiently. Dynamic modeling for lithium batteries is widely discussed in the literature (Li & Ke, 2011; He et al., 2012; Zhao et al., 2015; Guo et al., 2017; Benabdelaziz et al., 2017). However, modeling of magnesium batteries activated by seawater has not been widely discussed because it is a new energy material that has not been exploited optimally. The experimental method used to find the optimum conditions for battery operation takes a long time and is expensive. Simulations require a relatively shorter time at a lower cost to determine the optimum operating conditions of magnesium batteries activated by seawater. Battery modeling is important to recognize more detailed battery characteristics, such as the minimum and maximum limit conditions of the allowed State of Charge (SOC) batteries. By knowing the SOC boundary conditions, the battery can be set to safe operation. The basic model approach of electrical circuits is widely used in presenting battery characteristics. The simplest basic equivalent circuit model consists of an ideal potential source arranged in series with the internal resistance. This is also called the Rint equivalent circuit model (Durr et al., 2006). The basic model of this circuit is very simple, but it is less able to represent battery SOC conditions. Another basic equivalent circuit model is based on a series of open potentials arranged in series, with resistors connected to a series of capacitor-resistor parallel systems called the Warburg impedance (Kuhn et al., 2006). The identification of the parameters in a model is called impedance spectroscopy (Mauracher et al., 1997). Shepherd’s modification model is an equation to describe the electrochemical parameters of the battery on the terminal electric potential, open circuit potential, discharge current, internal resistance, and SOC (Shepherd et al., 1965). The Shepherd model is relatively important, but causes looping algorithm problems in closed loop on modular models. A differential equation which represents the capacitor in the Shepherd modification model requires a longer simulation time. This looping algorithm problem can be solved by assuming the battery equivalent circuit model into Rint (Tremblay et al., 2007). In this study, the modeling used is the Shepherd modification model, combining the equation with the Rint equivalent circuit model on the discharge process of the magnesium battery activated by seawater. In the Rint equivalent circuit model, the differential equations that present the capacitor are removed to prevent long looping time problems. Some initial parameters use manufacturing data from the discharge curve of the magnesium battery in an open environment system, from which the discharge characteristics can also be studied. 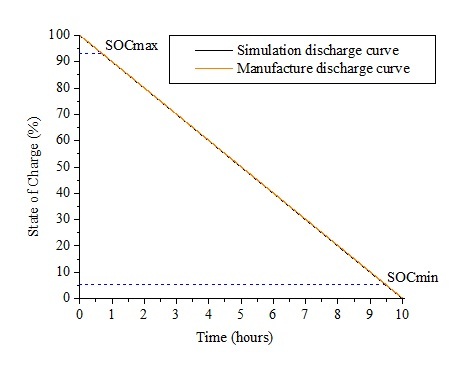 The discharge curve based on manufacturing data is also used to validate the model obtained. Battery discharge potential decreases from ±1.49 V to ±1.30 V, and is is stable after ±1.30 V to the SOCmin potential value (±1.29 V). Modeling the discharge using the Shepherd modification model combined with the Rint equivalent circuit model compared show that the manufacturing data is convergent with the modeling parameters E0 = 1.303 V; R = 0.012 ? ; Kdr = 0.01 ? ; Kdv = 5.794×10-4 V/A.h; A = 0.195 V; and B = 140 (Ah)-1. The SOCmin value of 5% was used as the minimum allowed safety limit so that battery performance did not fall drastically during operation. The SOCmax value of 93% was used as the maximum allowed safety limit to allow the battery to operate steadily. The percentage of simulated data error compared to manufacturing data was 0.85%. The author would like to thank the Department of Chemical Engineering, Faculty of Engineering, Universitas Brawijaya for facilitating this modeling-based research. The author hope the research results obtained from the modeling can be used as a reference for further research on magnesium batteries activated by seawater.